Properties in GUM Department Store average 4.2 out of 5 stars. Property 11: 1-room apt. Smolenskay st.Moscow.ID050. Apartments with the best view. Centre. Property 29: Apartments with the best view. Centre. 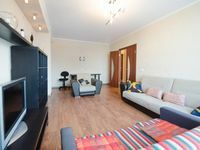 Property 32: 1 bedroom very quiet flat just off Tverskaya St.
Property 33: Beautiful Spacious Apartment in the city center! Property 40: 1-room apartment in Moscow. (ID 046). Property 49: Apartments on Belorusskaya.Junior Suite.